March 27, 2013 by Ken Ward Jr.
Well, you certainly can’t fault Kentucky Coal Association President Bill Bissett for not sticking to his story … whether he’s gotten all the facts in or not. Bissett said Friday he has not yet had chance to review Hendryx’s most recent study, but said he is skeptical of the findings. Purpose: This study investigates health disparities for adults residing in a mountaintop coal mining area of Appalachian Kentucky. Mountaintop mining areas are characterized by severe economic disadvantage and by miningrelated environmental hazards. Methods: A community-based participatory research study was implemented to collect information from residents on health conditions and symptoms for themselves and other household members in a rural mountaintop mining area compared to a rural nonmining area of eastern Kentucky. A door-to-door health interview collected data from 952 adults. Data were analyzed using prevalence rate ratio models. Findings: Adjusting for covariates, significantly poorer health conditions were observed in the mountaintop mining community on: self-rated health status, illness symptoms across multiple organ systems, lifetime and current asthma, chronic obstructive pulmonary disease, and hypertension. Respondents in mountaintop mining communities were also significantly more likely to report that household members had experienced serious illness, or had died from cancer in the past 5 years. Significant differences were not observed for self-reported cancer, angina, or stroke, although differences in cardiovascular symptoms and household cancer were reported. 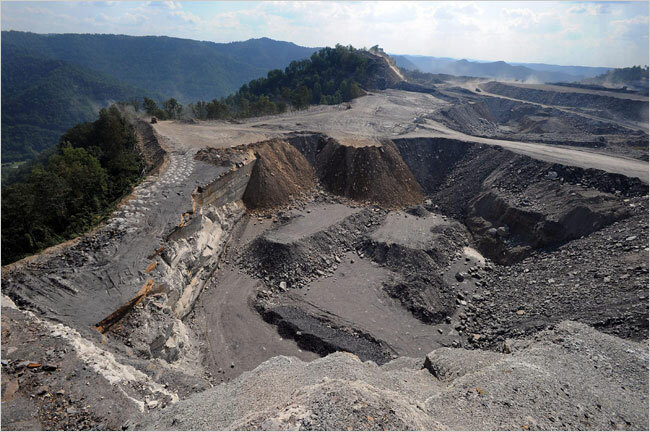 Conclusions: Efforts to reduce longstanding health problems in Appalachia must focus on mountaintop mining portions of the region, and should seek to eliminate socioeconomic and environmental disparities. This latest study is a follow-up paper to the one that Hendryx co-authored nearly two years ago examining cancer rates in the Coal River Vally area here in West Virginia, and it comes as related research continues to try to pinpoint potential causes for the increased illnesses among those living near mountaintop removal operations (see here and here). Coal industry officials like Bill Bissett are doing their best to try to get public officials to ignore this growing scientific evidence, but so far they haven’t been able to prove Hendryx wrong. Residents in the coal-mining communities of West Virginia suffer higher overall death rates than non-mining areas of Appalachia, according to a new University of Pittsburgh study made public Wednesday. The study, conducted as part of a coal industry-funded project, confirms some of the findings of West Virginia University research. However, authors of the new paper said their findings do not point as squarely at mining as a potential cause for increased coalfield mortality rates — at least not yet. “More studies will be needed to understand the complex interactions of environmental factors, personal behaviors and other risks to determine the extent coal mining plays in elevating mortality rates,” said lead author Jeanine Buchanich, deputy director of epidemiology at the Pitt Public Health Center for Occupational Biostatics and Epidemiology. Buchanich and her colleagues say in their study, “The categories in which we found excesses [in mortality rates] are arguably heavily influenced by personal behaviors and risk factors, including heart disease and lung cancer. “We were not able to control for personal risk factors in these analyses, including no control for confounding by smoking for causes of death highly affected by smoking, such as heart disease and respiratory system cancer,” the new study said. In an interview Wednesday, Hendryx noted that his research has controlled for a variety of other possible factors, including smoking, poverty and educational level, and still found increased mortality and illness rates in Appalachian mining communities. Also, Hendryx noted, the Pitt researchers said that further study should be performed to look more closely at the amount of coal mined and the type of mining — analyses that Hendryx and his co-authors have already done in their work. This is not a comment per se on the research, rather is meant more as context for blog readers less familiar with the academic publishing process.